What better way to celebrate the end of summer with the ones that you love most than by observing Family Fun month? For many across the country, the month of August marks the start of this exciting time of year, which makes it the perfect time to encourage parent like you to find fun and unique activities to help work in some extra time with your family. Plan a Camping Trip - There’s no better way get kids and adults to disconnect from technology and social media for family bonding than by taking them to the great outdoors for a good ole’ fashioned camping trip. Often time’s families can get so busy in their individual lives that the isolation of outdoor activities like camping can really bring a group together to bond in new ways. If you’re not able to venture to far from home, consider a simple backyard camp out. Observe Unique August “holidays” - Not only is August known as Family fun month, but it is also the time of year when people pay tribute to silly celebrations such as national ice cream sandwich day, friendship day, and national s’mores day. Days like these can be easily commemorated with the sharing of a sweet and thoughtful surprise. 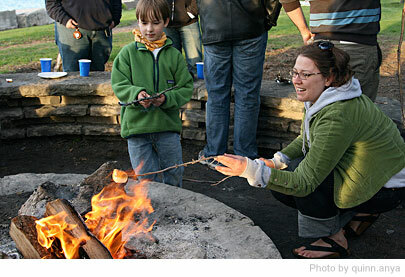 For example, you might attempt to roast marshmallows over an open fire and let your family members create their own unique take on the classic s’more! Community Scavenger Hunts - Plan a fun and interactive hunt through your community or city. There’s no better way to get the family outdoors to visit and learn about local sights. Start by mapping out locations to hide prizes or clues. Once that is finished, you’ll need to draft up clues to get your family members from each point to the next. The time spent piecing together clues and travelling to new places will give everyone ample time to have fun. Weekly Movie or Game Nights - Having a weekly activity planned for the month assures that everyone is able to regularly gather to enjoy each other’s company. Whether you choose to play a board game or watch a family friendly movie, scheduled activities like these can develop into family traditions that your kids come to cherish as they get older. Even if you don’t have the chance to explore some of these fun family activities, remember that this month is all about spending time with the ones that you love an cherish most. After all, when school picks up and everyone seems to fall back into their usual busy routines, it can become more difficult to find the time to connect with one another. Make August really count by planning some fun for your family, this month!